For three months, from September to December 2010, Michele Tizzoni will be visiting the Center for Complex Networks and Systems Research, at the School of Informatics and Computing of Indiana University in Bloomington, IN, USA. ...of scientific dissemination at ESOF2010, the Euroscience Open Forum that is taking place in Torino, Italy, in these days (July 2-7, 2010). ESOF is the biennal pan-European meeting dedicated to scientific research and innovation, created by Euroscience, and aimed at presenting breakthroughs in disciplines as varied as maths, music, geography, genetics, etc. through a range of different formats including lectures, workshops etc. Feel sick? Follow the money! How much do we know about human mobility? Can we use the information about the human interaction to predict the dynamics of emergent infectious diseases? This session will bring together the major experts in the field of human contact patterns and mobility of individuals at different scales: they will show and discuss which is the role of human mobility in shaping the epidemic patterns. Check here to see the full scientific program of ESOF 2010.
that will take part within the ICCS2010, International Conference on Computational Sciences, Amsterdam, The Netherlands, May 31- June2, 2010. Have a look at the webpage of the workshop for the full program. 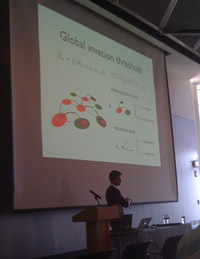 EpiFor team participated to NetSci2010, the International School and Conference on Network Science that took place at the Northeastern University in Boston and at the MIT Media Lab in Cambridge, MA, USA, May 10-14. NetSci is the annual meeting of the community of Network Scientists. Bringing together leading researchers, practitioners, and teachers in network science (including analysts, modeling experts, visualization specialists, and others), NetSci fosters interdisciplinary communication and collaboration. 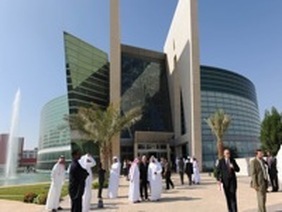 The conference focuses on novel directions in networks research within the biological and environmental sciences, computer and information sciences, social sciences, finance and business. EpiFor team contributed to the event with two oral presentations. 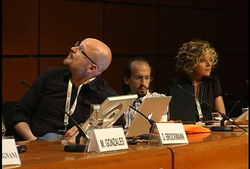 Global invasion of H1N1 influenza: could have we stopped it by grounding planes?, a contributed talk presented by Paolo Bajardi in the Epidemic Spreading session (Wednesday, May 13) [see picture on the left]. Pandemic influenza and medical response: assessing the sustainability and ecotoxicity risks , an invited talk by Vittoria Colizza (Wednesday, May 13). 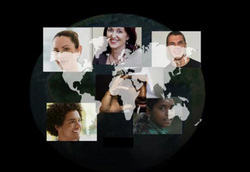 EpiFor team will participate to the APS March Meeting 2010 that will be held in Portland OR, USA, March 15-19. Every year the APS annual meetings draw more than 12,000 of the top scientists involved in physics research and education from throughout the world. The March Meeting offers a valuable opportunity for one-to-one interaction with physicists from industry, universities, and both private and government laboratories, as well as a great opportunity to disseminate research results to a wide audience. Human mobility in an emerging epidemic: a key aspect for response planning, a contributed talk presented by Chiara Poletto in the Focus Session: Complex Networks I (Monday, March 15). Human mobility and epidemic invasion, an invited talk by Vittoria Colizza in the Focus Session: Stochastic Processes in Biology I (Wednesday, March 17). Epidemic Planet - explore how H1N1 influenza travels around the world and how intervention measures may help. 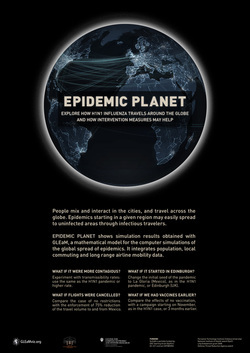 Epidemic Planet is the visualization application developed in the context of the GLEaMviz project, which enables its users to interactively compare and learn about the effect of a number of intervention scenarios on a pandemic, simulated using GLEaM. Its first public appearance was at the 3 months long INFECTIOUS Art & Science exhibition at the Science Gallery, Trinity College, Dublin, Ireland. In collaboration with the British Society for Immunology, Epidemic Planet lands at the Edinburgh International Science Festival. In this installation, visitors will observe the evolution of the 2009 H1N1 influenza pandemic since its early origin in Mexico, and will discover how the air traffic and commuting flows determined the spreading patterns of the flu worldwide. Moreover, through a large screen coupled with a touch-screen interface, visitors will be able to explore different scenarios of propagation of the H1N1 pandemic according to different initial conditions (what if the flu started in Edinburgh? what if it were more contagious?) and different intervention measures. In this way, they will learn how the flights ban or the early distribution of vaccines could have affected the spreading of the pandemic. The venue of the Epidemic Planet exhibition will be Hawthornden Court, in the National Museum of Scotland. Check out the programme of the Festival! 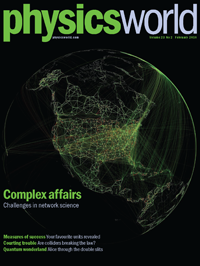 The February 2010 issue of Physics World presents a special focus on Complexity and challenges in Network Science. From mapping the rise of the field, to examples of applications rooted in our everyday life, to charting the field’s possible future evolution, the special issue explores the key topics of Network Science - a field where physicists have been playing a major role. A special feature is dedicated to infectious diseases, how they rapidly spread in our modern society, and what weapons we have nowadays to fight them. 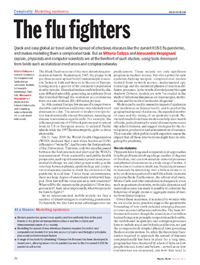 The article titled The Flu Fighters by Vittoria Colizza and Alessandro Vespignani describes the contribution of physicists to an interdisciplinary area where complex systems are the main ingredients, and modeling human behavior and biological contagion is the ultimate challenge. The cover of the special issue shows an illustration by B. Goncalves et al. of the multiscale worldwide mobility networks used in the GLEaM model. 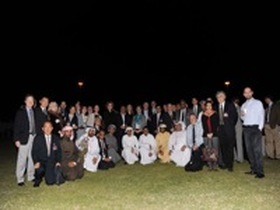 Vittoria Colizza participated to the International Conference Global Health and the UAE: Asia-Middle East Connections that took place in Al-Ain, United Arab Emirates, January 4-8, 2010. The goal of the conference was to highlight global health problems that are emerging across Inter-Asia in the new millennium and are, in fact, a reflection of the global flows (of humans, diseases, commodities, and capital) between these three major regions of the world (the Middle East, South Asia, and East Asia). The conference brought together over 50 public health scholars, medical anthropologists, behavioral scientists and public-health practitioners from the Middle East/North Africa, South Asia, and East/Southeast Asia. Check out the program at the conference webpage! Colizza also published an article titled Health officials ponder how to fight stowaway microbes on The National (UAE national newspaper) on January 3, 2010 (see the outreach page). In a special issue Airneth Column, Vittoria Colizza discusses the effects of travel flows on epidemic phenomena. Airneth is a worldwide scientific network for aviation research and policy. Global invasion of the H1N1 influenza by air travel during the early outbreak. The arrows represent the seeding of countries by infected travelers (source data from official reports), and the color code indicates the time of the seeding. Check out the column titled 'People interact. They travel. And diseases might travel with them' on Airneth website! 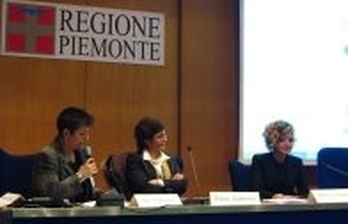 Vittoria Colizza was invited to participate to the event 'Eccellenze al femminile' (Women & Excellence) to discuss about the role of women in today's society. See also the interview following the event. 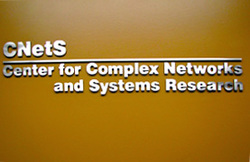 Vittoria Colizza was invited as a tutorial presenter at the National Academies Keck Futures Initiative 2008 on Complex Systems. "It always bothers me that, according to the laws as we understand them today, it takes a computing machine an infinite number of logical operations to figure out what goes on in no matter how tiny a region of space, and no matter how tiny a region of time. How can all that be going on in that tiny space? Why should it take an infinite amount of logic to figure out what one tiny piece of space/time is going to do? So I have often made the hypothesis that ultimately physics will not require a mathematical statement, that in the end the machinery will be revealed, and the laws will turn out to be simple, like the checkerboard with all its apparent complexities." To help overcome differences in terminology used by researchers in various fields, plenary tutorials were given by experts before the conference. Colizza's tutorial titled Spreading Processes & Complexity was webcasted on Sept 24, 2008 at 1pm - here you can also find the Q&A session following the webcast. The European Research Council has named Vittoria Colizza one of the 201 recipients of a Starting Independent Career Grant, out of a total of 9167 proposals received. 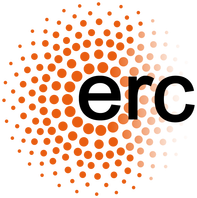 ERC Starting Independent Researcher Grants aim to support up-and-coming research leaders who are about to establish or consolidate a proper research team and to start conducting independent research in Europe. The grant will provide 5 years of funding to support the EpiFor project and to establish a new team of research at the host institution, ISI Foundation, Turin, Italy. Dr. Colizza will conduct research activities onComplexity and predictability of epidemics: toward a computational infrastructue for epidemic forecasts.